As conditions deteriorated between the rulers in England led by King Charles III and the colony of Massachusetts. The men of Mendon belonged to one of 4 companies. Captain John Albee commanded the first company, Captain William Jennison the second, Captain Joseph Daniels the third and Captain Gershom Nelson the fourth. It was mid-morning, Wednesday, April 19th when the citizenry of Mendon were informed that the British regulars had marched overnight to Lexington and shortly after their arrival had fired on and killed a number of the town’s Minutemen. At Lexington, a Bostonian named Revere had ridden into the night to forewarn the local folks that the troops were coming to seize powder stores and cannons located in their town. Having arrived around midnight, Revere had provided the town plenty of warning to move the powder and cannon to newly concealed locations. If additional help was required from the region a system of rapid communication, or alarm, would call area militia's to arms and on this was the day the 4 companies in Mendon would be put to the test. Details of the conflict revealed that General Gage had ordered British officers, Lt. Colonel Francis Smith of the 10th and Marine Major John Pitcairn to lead the Grenadiers and Light Infantry of the British army throughout the night to Lexington. Their goal was to preform a surprise raid to seize powder and cannon's located there. When they arrived Parker’s men some 75 strong were waiting at the Green at 5 am that morning. Under poor lighting conditions the confrontation went from a row of defiant Minutemen standing with arms in hand to the dawn of the Revolutionary War shortly after their arrival. Eight of Parker’s men lay dead with ten more wounded. It became clear that on that day the war with England had begun. The moment the alarm arrived the local men and boys of the 4 militia companies responded. 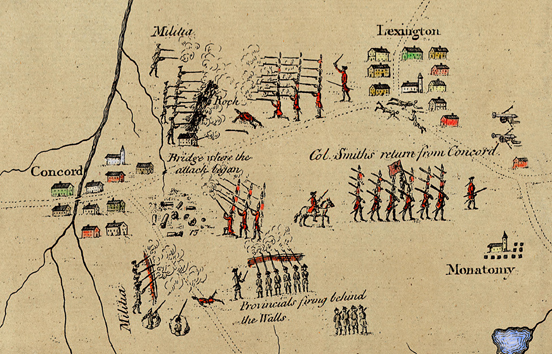 The 4th Mendon company led by Captain Nelson were the first to leave for Roxbury and then on to Cambridge. Captain Nelson's 42 men were Mendon's designated company of Minutemen soldiers. Their orders required them to be on their way to the conflict within 30 minutes of the sounding of the alarm. The three remaining Captain's assembled the remaining Mendon companies and began their march to Roxbury. 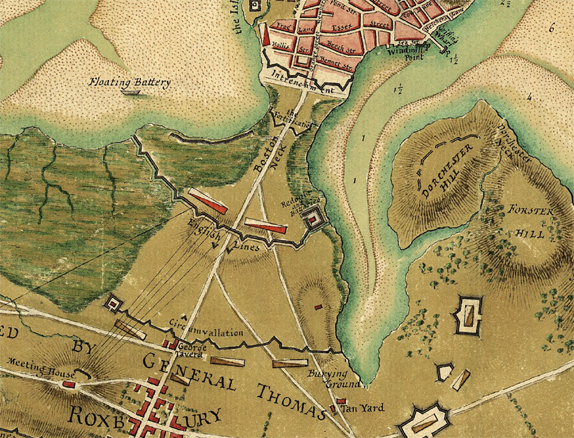 Located just west of the area known as Boston Neck, Roxbury was the gateway into and from Boston over land. The proud members of the Mendon militia left town with their 2 cannon in tow. Reports and rumors continued to come throughout the day and into the evening. The people of Mendon learned that the fighting had spread to Concord and intensified and later to Menotomy. Some said they saw up to a one thousand red-coated reinforcements marching through Roxbury and then Brookline shortly after sunrise on a road in the direction of the fighting. My God, what was next? Mendon's contribution was unique in that the majority of the townsmen and older teenagers had responded positively to the recruitment effort when the militia was formed in the fall of 74. The town was only required to offer up a quarter of the men she provided to the effort. It was springtime in this rural farming community. Field and crops and farm animals took a lot of work and now everything came to a standstill. Margaret Daniels had plenty to be worried about with 4 of her precious family members marching under orders to Roxbury. Her husband, Captain Joseph, 3rd Mendon Company; daughter Elizabeth’s husband, Private Persevard Baker, 3rd Mendon Company; daughter Diadem’s husband, Sergeant Timothy Wiswall, 4th Mendon Company and 22 year old nephew, Private Moses Daniels, 3rd Mendon Company had all left for battle. Tension filled the air, information always lagged the actual fighting by hours due to the distance involved. Would the fighting spread to Cambridge, Brookline and Roxbury next? Late into the night news would come that the British had turned north toward Charlestown to avoid the massive build up of militia at Cambridge. The decision to head north came as the distance was calculated for the shortest route to the safety of Boston and it's harbor filled with ships and cannon. Shortly after daylight Lord Perry and one thousand british regulars had been seen marching toward Lexington in an effort to rescue Smith's soldiers who had fired on the citizens thus beginning the Revolutionary War that day. Soon it became clear that war had started as reports of local citizens being murdered in their homes and massive casualties taken by the retreating British raiders. When it was all said and done they learned that the British troops had suffered greatly as they retreated. Minutemen and other militia arrived throughout the day from as far as 50 miles and as their numbers grew the Redcoats were reduced from deaths, wounds and fatigue. With ammunition running short the only saving grace for them was that a number of reinforcements had arrived and they took some high ground to rest. At Menotomy their retreating army came into heavy fire causing them to make a turn toward Charles Town. Once there, the firefight dwindled due to a lack of cover for the Americans, The British troops were able to wait for boats to carry the remaining troops back to the relative safety in Boston. General Gage had miscalculated the ability of the colonies "farmer army". It never dawned on him that those farmers were skilled marksman using the same weapons being trained on them to provide food for their dinner tables. The scant organization of local militia would soon become a formidable and effective army. Here's a Roll of the men in Captain Joseph Daniels, 3rd Mendon Company that marched from Mendon to Roxbury on the 19th of April, 1775. The men would spend a total of 9 days manning their position at Roxbury allowing any and all citizens who were concerned about the British occupation to leave for the countryside. Thousands moved from their homes into the countryside as tensions built into what would be called the Siege of Boston. The Provincial Congress in Massachusetts orders 13,600 American soldiers to be mobilized. The continental army and state militias formed camps around the city and begin a year long siege of British occupied Boston. May 15th, The Second Continental Congress convenes with John Hancock elected as its president. Congress places the colonies in a state of defense. June 15, the Second Continental Congress unanimously votes to appoint George Washington general and commander-in-chief of the new Continental Army. In late July 1775, word spread like wildfire that a large number of British war ships had sailed into Newport and demanded that the local citizens supply them with provisions. The Daniels farmstead was a fair distance from the island where Newport was located; however, the Rhode Island border was a short 3 miles to the south of their farmstead. Given no other choice other than bombardment of the wealthy town, the provisions were provided and the fleet sailed without incident. Many of those living in Newport found the incident unsettling and moved to the mainland. Needless to say an uneasy feeling remained for all those in the surrounding countryside. Would the British sail up the Narragansett Bay to Providence, less than a day’s march away from south Mendon? The British warships returned to Narragansett Bay under the command of Lord Percy taking control of Newport and Conanicut Island to the west. This gave the British control over the 3 passageways to the Long Island Sound, in effect trapping all ships north of the occupied territory to Providence. December 10, 1775, 17 year old Joseph Daniels Jr. son of Captain Joseph Daniels, Mendon joined Captain John Tyler company of men raised from Mendon, Uxbridge & Upton and joined Colonel Joseph Reed's regiment. Eleazer enlisted as a volunteer at Mendon in the County of Worcester in the State of Massachusetts for the term of three months. Eleazer's sister Elizabeth's husband, Lieutenant Preserved Baker led Eleazer and other newly enlisted soldiers to a strategic location at Dorchester Heights, near Boston. Lieutenant Baker served in Capt. Samuel Baldwin's (Northbridge) Company under the regimental command of Col. Nicholas Dike (Westminster) in the Massachusetts Milita. The company was located in the Barrack at Dorchester Heights. 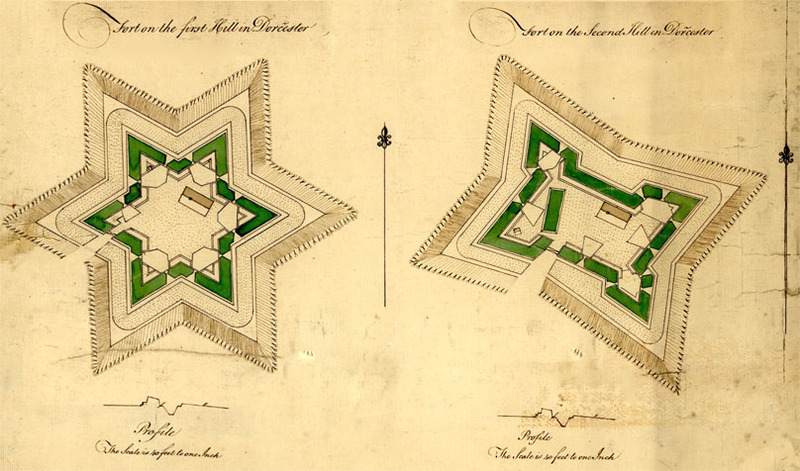 Regimental responsibilities included guarding the two forts at the Heights and another fortress, Castle William, on a small island in Boston Harbor. After Eleazer's 3 month term expired decided to reenlisted while at Dorchester Heights. February 15, 1776, Colonel Ezra Wood’s (Upton) Worcester County regiment was reorganized resulting in the promotion of Joseph Daniels to Major The assignment of the regiment’s officers had been proposed by the legislature on January 12, 1776. The regiment was to include men from Mendon, Uxbridge, Northbridge, Upton and Douglas. Eleazer Daniels.... details to follow.